One of our popular classics! 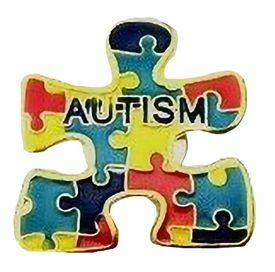 This Autism Puzzle Awareness Pin has a butterfly clasp and the word "Autism" on the pin. It is in the shape of a puzzle piece and the background is multi-colored enameled puzzle pieces. Futures the word "Autism" across the bottom of the pin. New product and a great fundraising item!